If all goes well, cyclists and runners will no longer need to dodge traffic while out for some exercise. By Steve Annear·	 8/6/2014, 2:07 p.m.
For nearly five years, Renata von Tscharner has been advocating for the installation of underpasses at several bridges that connect Boston to Cambridge along the Charles River, so runners, pedestrians, and cyclists could enjoy a continuous path without having to stop at intersections and wait for cars to pass. Now, her tireless efforts may finally pay off. 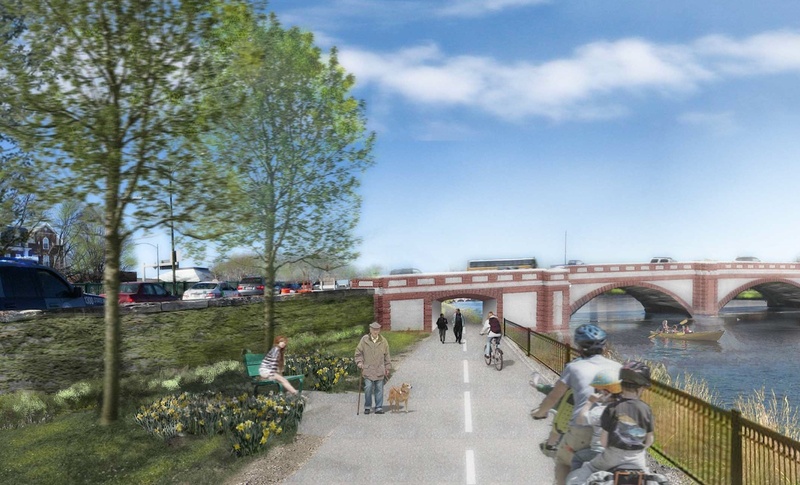 The Massachusetts Department of Transportation announced this week that they were throwing support behind a plan to put an underpass on the Boston side of the Anderson Memorial Bridge. By building an entryway into the bridge, it would provide enhanced connectivity for cyclists and runners. Although the plan is still tentative, and there’s no timestamp on when construction will begin, a letter dated July 31 from MassDOT Secretary Richard Davey to Conservancy members, indicated that the state would move ahead with the initial design concept. “We are happy to support the underpass through the Boston abutment of the Anderson Memorial Bridge and engage in the process necessary to ensure the feasibility on this project,” Davey said in the letter. Davey said the state will retain the services of an engineering team to undertake much of the work to advance the plan to the 25 percent design phase. He said the work the team does would include cost estimates, sketches, and securing the proper permits to move the proposal forward. Pending approval from the Massachusetts Historical Commission, the Army Corps of Engineers, and MEPA, all of whom need to sign off on the changes to current construction plans, Davey said MassDOT would be committed to building the underpass. The Anderson Memorial Bridge, which connects Allston to Cambridge, is currently under construction as part of the state’s Accelerated Bridge Program. Originally, when the Conservancy and other organizations tried to include an underpass as part of the rehabilitation plans, the state said there was no money for it. “The request for underpasses was something MassDOT took a look at but the two principal issues we’d run into would be time and money. Taking these bridges out of the [Accelerated Bridge Program] to design underpasses would mean we’d have to find funding elsewhere,” a spokesperson said back in 2012. What changed the state’s mind wasn’t immediately clear, and Boston is awaiting a request for comment. But von Tscharner said from what she understands MassDOT will be using existing funds to make way for the underpass. Davey said in his letter to the Conservancy that if building an underpass into the Anderson Memorial Bridge is feasible, the state would also support a move to include similar tunnels as part of the River Street and Western Avenue Bridge reconstruction plans. Those plans, however, remain up in the air, since Davey’s tenure as MassDOT Secretary could come to an end as Governor Deval Patrick leaves office. The construction timetable for both River Street and Western Avenue have also been pushed back to 2019. Regardless, members of the Boston Cyclists Union, a non-profit that supports better biking infrastructure all around the city and its connecting communities, were similarly delighted by the news that the state finally came around. The announcement also drew cheers from people from the Cambridge Running Club, who long complained that the intersection at the Anderson Memorial Bridge left runners vulnerable during their daily jogs.